The Whole-Body Cleanse You've Been Looking For. THE pH MIRACLE WHOLE BODY CLEANSE: "THE LIQUID FEAST"
The pH Miracle Whole Body Cleanse eliminates acid wastes and negative microforms throughout your body, detoxifying your blood, tissues, and the entire alimentary canal/alkaline buffering system. We recommend at least a seven-to-fourteen day pH Miracle Whole Body Cleanse—up to twenty-one days if seriously ill. (You may seek coaching for your cleanse HERE or also join a Group Cleanse for support). If you can't take much time out from your schedule, three days can have some benefit. The shorter cleanse is also good for older people or children and teens. While you are on a pH Miracle Whole Body Cleanse, you should drink at least four liters of purified water with pH drops daily, add fresh lemon or lime juice if you like. You should also enjoy six to twelve eight-ounce glasses of fresh green vegetable juice, to help clear the acidic toxins out of your system and return your body to its alkaline design. Below we'll give you a simple hour by hour schedule to help you plan your daily cleanse schedule. Alkalizing supplements can maximize the effects of a pH Miracle Whole Body Cleanse and bring the body into balance more quickly, controlling dietary and metabolic acids and negative microforms. Remember that less, more often, is better than more, less often. That is, taking one capsule six times a day is better than two capsules three times a day or three capsules two times a day. 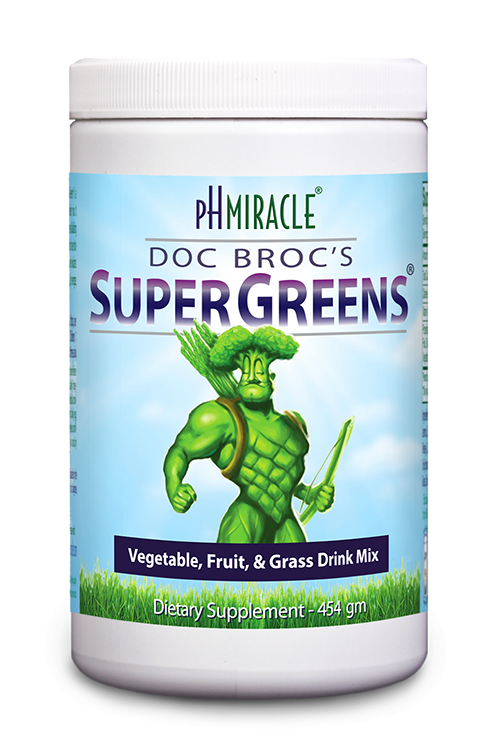 The most crucial supplements are PuripHy or alkaline pH drops, pHour Salts (alkalizing mineral salts), and concentrated green powder—Doc Broc SuperGreens . Add four drops of pH drops per cup of pure water. Mix one-quarter teaspoon of the concentrated green powder into eight ounces of pure electron-rich alkaline water three times a day, or take one capsule three times a day with a "meal" or drink. These basic starter supplements are featured below. A Multivitamin and a Multi-Mineral with cell salts are close second in importance because all other nutrients, including proteins, anti-oxidants, amino acids, and carbohydrates, require minerals for normal biochemical functioning. So do all the alkaline buffers. Dr. Young also recommends these liquid colloidal supplements if possible: liquid Chlorophyll, Glutathione, and colloidal Silver. 7:00 am: Test the pH of your urine with a pH Test Strip. If the urine pH is below 7.2 take 2 teaspoons of pHour Salts in 5 ounces of water. When you're juicing you can use carrot or beet to sweeten the taste; but, they contain sugar, so you always want to use them moderately. If you are dealing with an acute condition, you don't want to use them at all. wheat grass, barley grass, watercress, parsley, cabbage, spinach, alfalfa sprouts—just about any other green vegetable that you like. We recommend the PowerGrind Pro Juicer and most enjoy this combination: one cucumber, one stalk celery, one-third bunch parsley, a handful of alfalfa sprouts, and some spinach leaves. Noon: Test the pH or your urine and saliva with a pH Test Strip. If either is below 7.2 take 2 teaspoons of pHour Salts in 5 ounces of purified water. 5:00 pm: Test the pH of your urine with a pH Test Strip. If the urine pH is below 7.2 then take 2 to 3 teaspoons of pHour Salts in 5 to 6 ounces of water. 7:00–9:00 pm: Pure Water with pH drops as desired. 9:00 pm: Test the pH of your urine with a pH Test Strip. If the urine pH is below 7.2 take 2 teaspoons of pHour Salts in 5 ounces of water. All this can have quite a laxative effect—which is the way your body physically gets rid of the acidic bad stuff. It doesn't just evaporate. Until you know your body's response to the program, it is wise not to have anything else planned so you can focus on the pH Miracle Whole Body Cleanse—and just stay fairly close to bathroom facilities as the acidic toxins clear from your body. During a Cleanse, toxins are dumped from where they've been stored in the tissues into the blood to be eliminated. That means that for a while, your blood is actually dirtier than it started out. That can mean you feel worse before you feel better. Different people experience varying degrees of unpleasantness during this "healing crisis," which may include nausea, weakness, dizziness, headaches, lightheadedness, rashes, bad breath, flulike feelings, and fatigue. When and if this happens, increase your daily alkaline water intake. Lots of alkaline electron rich water with pH drops and fresh lemon or lime juice will help flush the toxins (and their negative effects) out quickly. And by all means, modify your approach if the results seem too vigorous.